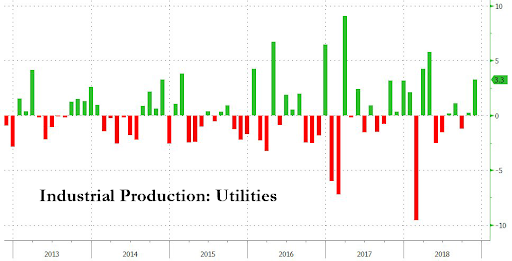 On the heels of the dramatic slowdown in Chinese output, and after slowing in September and October, US Industrial Production was expected to rebound modestly in November and it did (but don't get to excited yet). Bloomberg notes that excluding autos, manufacturing output stagnated for the second time in three months. The industry may be settling into a somewhat cooler pace, consistent with projections that economic growth will moderate this quarter and into next year, as the boost from lower corporate and consumer taxes wanes. The slowdown in factory output included a 0.2 percent decline in business equipment and a third-straight drop in construction supplies. Notably, this 'hard' data is weaker than the signal from a separate report that showed the ISM's factory index rebounded in November from a six-month low.